Stand out in a sea of rectangle suitcases with this stylish bag designed for maximum organization. A plain rectangle suitcase would suffice if you were well... plain. 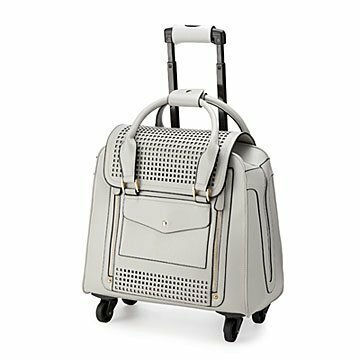 But you like to stand out, and this luxury-handbag-on-wheels is more your style. The high-quality vegan leather has a deep interior compartment, and also features multiple exterior pockets: a tablet pocket, a smaller zippered pocket for quick-grab items, an interior removable laptop sleeve, and more secluded pockets inside for valuables (credit cards, passports, your phone). The handles take it from rolling suitcase to fashionable, everyday bag in a snap. A great gift for world travelers, or just the one who's always on-the-go, the design comes in sleek black or grey. Made in China. Stylish,and high end rolling bag! After traveling in Europe over the holidays through very large airports, I realized I needed a better carry on and something with wheels! Saw this a knew it was the one! Large enough for all my stuff (in case other luggage is lost) but with smooth wheels ( multidirectional). Looks very high end, beautiful soft grey. Great purchase!